ABOUT PHAIDONPhaidon is the world’s premier publisher of books on the visual arts. We believe passionately in the creative act and aim to make it exciting and understandable by all and to celebrate its greatness in everything we produce. We have published books with some of the most creative artists, architects, designers, photographers and chefs of the 20th and 21st centuries. We work collaboratively with the creative arts world’s most inspiring names to achieve the most faithful representation of, and the truest insight into, the way those artists and visionaries interact with the world around them – whatever medium they work in. phaidon.com is currently spending its lunch breaks reading through the excellent Focus series of books that are published next month – today we finished the Anselm Kiefer one by Matthew Biro. First a little about the Focus series. The books are designed as a lively, authorititive and accessible introduction to the work of the artists featured in the (initial) six-strong series (Kim, the editor, is already hard at work on the next instalment). As the title suggests, each features special Focus sections that explore specific and important themes, series, pieces or events in each artist’s career, so whether you’re new to the artist or you already know a bit you’ll come away enlightened and, we hope, nourished. With an artist like Kiefer you can imagine the focus points are many and varied. We don’t have room here to bring you a precis of all of them – and naturally we want you to buy the books. However, we can say it was a tough choice picking just one particular ‘Focus’ to represent what is an engaging yet thorough book by the foremost Kiefer expert. In the end it was a choice between Biro’s brilliantly enlightening deconstruction of Kiefer’s 1981 work Interior, Innenraum and his description of La Ribaute – the studio complex the artist began creating in the 1990s and what Biro calls ‘a total work of art’. In the end, we plumped for the latter purely because it’s better suited to a blog entry and because we suspected a few more of our readers might not now that much about it. “From the mid 1990s, Kiefer’s Barjac studio-estate, which spread over 35 hectares (86 acres), also became his most ambitious project, where he made, displayed, warehoused and imagined his oeuvre. A former silk factory on a hill that the German expatriate transformed into a vast complex of living spaces, studios, workshops and storage facilities, it was also an environment in which he created a new type of ‘land art’ consisting of gigantic concrete structures, some reduced to post-war-like ruins, in the midst of the rural French countryside. For some, La Ribaute was Kiefer’s ‘Gesamtkunstwerk’, or ‘total work of art’, a theatrical experience that combined multiple media and that stood as the pinnacle and sum-mation of his career. As this studio complex developed over 17 years, it grew in shape and complexity. Originally consisting of three nineteenth-century stone buildings surrounded by fields and woods, it was expanded with a single-minded intensity to combine modern functional structures with strange, unwieldy, reinforced-concrete constructions. Since the late 1990s, more than fifty separate edifices – glass and steel greenhouses as well as concrete bunkers – were erected on the property; and, in the new millennium, an amphitheatre and a crypt were added as well as massive concrete towers, sculptural waves and freestanding staircases. Entering a golden courtyard through a hidden gate in a hôtel particulier in the Marais, you expect the noise and dust of Paris to still instantly. 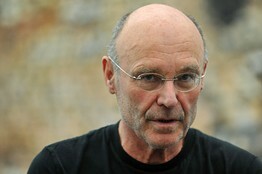 But in German artist Anselm Kiefer’s stately home in the French capital, you instead meet chaos. Assistants shriek as they lug giant boards across cobbles. Bricks totter, barbed wire sways, a motorised buggy whirrs. Sculptures of life-size, headless figures ballooning into white crinolines lend a surreal note. Through the din, a thin, greying, ascetic-looking man in black T-shirt and jeans carefully dabs lead on a large panel crusty with silver-blue impasto. When I admire his fragmented women, Kiefer laughs dryly and inquires which one I identify with. Spidery graffiti on stone walls reveal that the martyr topped with a rack is the tortured St Catherine; the brick block-head belongs to Greek courtesan Phryne, who offered to rebuild Thebes; and a figure whose neck soars into a tower of charred books is Sappho but also, the artist adds, “a monument to all the unknown women poets”. Kiefer is a builder-scholar who makes art from a mix of rubble and mythology. The sets and props filling his courtyard are for the world premiere of Am Anfang (In the Beginning), with which the Bastille Opera celebrates its 20th anniversary next week; the production is also Gerard Mortier’s Paris swansong. It is Kiefer’s first work with opera, though not for want of invitations. “I am usually offered Wagner,” he grins, “but I say no because it’s too …” he flounders for the English word, “too next”. Kiefer does indeed recall Wagner. His dense, coagulated paintings, layered with materials from wire cages to sunflower seeds to children’s clothes, and sculptural installations such as the sombre “Palm Sunday”, currently on show at Tate Modern, evoke the grand narrative structures and metaphysical scope of the 19th-century romantic tradition. But Kiefer is also a 21st-century multimedia artist, and for the Bastille he strikes an experimental note. Working with young clarinettist and composer Jörg Widmann, he crosses art with new music and a sort of abstract drama: “the actors look like sculptures; they don’t move; I’ve even painted their clothes” . His condition in accepting Mortier’s invitation was “not to play it all on one level. The Bastille is on nine levels, with studios on different floors; it’s like a little town, and I thought, I’ll do it if I can play it as a landscape.” He has piled up “12,000 years of bricks” on different stages, while 12 towers – representing the tribes of Israel – shudder as Widmann’s chords “sound through the ruins like celestial messengers come from the desert, to take possession of space and time”. Beginning in 600 BC, “when there was a lot of action in the fertile crescent, the Jews were separated into the diaspora, there was a sense of the world melting” – but paralleling today’s political unrest too – the opera turns on history’s endgames, from the destruction of Babylon and Thebes to the Trümmerfrauen, the “rubble women” who scratched and scraped at Germany’s debris in 1945. The visual imprint of his childhood is inescapable in paintings and sculptures which turn on ruined buildings, burnt-out remains, grey-brown-black tonalities. “As a child I had no toys; our house was bombed, but there were lots of bricks. Ruins are wonderful because they are the beginning of something new, you can do something with them.” By the age of four, he was a little builder, begging “for bits of cement, but they couldn’t give me any”. He is still compensating, he laughs. He erected 52 new buildings around his atelier in Barjac near Nîmes, creating his own village; his second Paris studio is the enormous former depot of department store La Samaritaine. Kiefer dots his conversation with wry jokes, as if forcing himself to lighten up, but he remains, like his art, deadly earnest. “The psychological situation” of Germany during his childhood “was horrible. There is no morality about war; it always destroys people’s minds.” He began his career as a photographer with performances mimicking the Nazi salute; his work, infused with Jewish mysticism and post-Holocaust writings such as Paul Celan’s Death Fugue, is one long challenge to the Germans “who tried to forget”, as well as a self-doubting response to philosopher Theodor Adorno’s questions about art after Auschwitz. “I had no responsibility but I feel completely involved. In the night I still think someone can come to take me away. The denunciations … I know it won’t happen but I wake up and think on that. The brutishness, the horror is unimaginable.” He left Germany in 1990, the year of reunification. In In the Beginning, the Jewish people “stride across the stage, delineating its limits, heading for where there is nothing other than nothingness”. The key biblical quotation is from Isaiah: “My heart panted, fearfulness affrighted me. The night of my pleasure hath He turned into fear unto me.” Is there then, I ask, no redemption in Kiefer’s vision? Anselm Kiefer has been fascinated with Mao Zedong since the ’60s. With propaganda images burned into his memory, the 67-year-old has painted Mao throughout this career, but this week’s solo show at White Cube in Hong Kong marks his first in Greater China. “Let a Thousand Flowers Bloom” includes sculptures and vast landscapes with faint images of the former Chinese leader in the background. Mr. Kiefer rose to fame in 1969 with “Besetzungen” (“Occupations”), a series of self-portraits in which he displayed Nazi salutes. He became a fixture at the Venice Biennale in the 1980s and has been the subject of solo exhibitions at the Museum of Modern Art, the Guggenheim Museum in Bilbao and the Academy of Arts London. In 2007, he was the first artist to be given a permanent commission at the Louvre since George Braque in 1953. Last year, he was the subject of “Over Our Cities Grass Will Grow,” a documentary that featured the gigantic sculptures and buildings that he created in Barjac, a village in southern France. He also has plans for an ambitious installation near Koblenz, Germany, at the site of a decommissioned nuclear reactor, though the local Green Party has so far blocked the purchase. Mr. Kiefer spoke with The Wall Street Journal about misquoting Mao, destroying photography and how his studio functions as his brain. Below are edited excerpts from the discussion. The Wall Street Journal: What inspired this show? Mr. Kiefer: I was, for a long time, interested and fascinated by Mao. The first paintings I did about Mao were already in the 1980s. When this show was coming up, I was pre-occupied with Mao. What inspired the landscape format of the paintings? They are based on photos I took in Auvergne, in France. It was many years ago. It’s a mountainous area. We went in springtime, and it was blooming everywhere, like an explosion. I took a lot of photographs, but I was disappointed. A photograph is only one layer. It’s very flat. You can see the photographs underneath the paintings. Now I’ve painted the photographs, adding meaning and giving it layers. I destroy the photographs with my painting. “Let a thousand flowers bloom” is a misquotation of Mao and a reference to a period of supposed reform in 1957. The title is not only ironic. It’s complex. In the 1960s, in Europe and in Germany, Mao was a moral institution. Students were looking in the Little Red Book for solutions, even if they had a problem with their family, or their children. I was fascinated, and I admired Mao, but at the same time, I also thought something was wrong. Your early work dealt with the legacy of Adolf Hitler. How does he compare to Mao? There are parallels, but there is a big difference: Mao was a cultured poet. Hitler was a petit bourgeois. His taste, concerning art, was really bad. You visited China once in 1993. What did you learn from that trip? It taught me that history is not objective. History is formed by the people, those who have power and those without power. Each one of us makes history. Each time period will construct its own Mao. In 10 years, you’ll have another Mao picture, another Mao idea. If the personality is rich, like Mao was, you’ll always have new interpretations. You moved to Paris in 2010. How are you adjusting to life there? I’ve worked all my life in the desert, in isolated places. I was isolated in Germany, and I was isolated in the south France. It’s good to be in the city. For once in my life, I want to be in the center, surrounded by colleagues, intellectuals, poets. You have an unusually large studio. How do you work there? It’s an old department store warehouse. I have 36,000 square meters. There I can see all that I’ve done all my life. My paintings never finish. I have paintings there from the 1970s. If I have an idea, I can take it out and finish it. The whole space is like my brain. It’s like I’m walking through my brain. Some critics have described your work as depressing, something one can tolerate in a gallery but not at home. How do you respond to that? If I do something that depresses, it’s not because I’m depressed, but because political life and history is depressing. When Hitler was overcome, we thought we would be in a better world. But we are not. We had Rwanda and so many other massacres. This tristesse isn’t just mine. But I don’t feel sad. I’m happy. It was to be expected that the Anselm Kiefer retrospective, which opened at the Art Institute of Chicago in December, would be accorded a rapturous reception, and so it has been. Throughout the nineteen-eighties, as the art market soared and an almost unencompassable quantity of meretricious painting glutted the galleries, the museums, and the public consciousness, the emergence of a new master—an artist who could be seen as transcending the more compromising scenarios of the new art scene—was anxiously awaited. And no sooner was the need for such a redemptive figure openly acknowledged than a consensus of sorts seemed to settle on Anselm Kiefer as the leading candidate. This young German painter, born in 1945, seemed to have everything that the role called for: talent, vision, ambition, dignity, and the kind of gravitas that was so conspicuously lacking in so many other artists who were swamping the scene. He even seemed to be in possession of that rare thing in contemporary art: an interesting mind. Most important of all, however, was the fact that Kiefer had a subject guaranteed to win the nervous attention of the entire Western world: the nightmare of the Nazi era and its meaning for European civilization. Both the subject and Kiefer’s handling of it conferred an almost instant distinction on the artist, and he quickly became one of the mythic figures of the international art world. In New York, remarkably, it wasn’t even held against him that he exhibited his work at Mary Boone’s. From the outset he was exempted from the usual strictures as critics hastened to register their approval—and their awe. It therefore came as no surprise when, in reviewing the current retrospective in Time, Robert Hughes—on this occasion, as on so many others, voicing the established opinion as if it were a personal discovery—hailed Kiefer with the kind of praise (“the best painter of his generation … an unmistakable greatness of vision … a victory for the moral imagination”) usually reserved for the likes of Titian, Rembrandt, and, well, Lucien Freud. The stampede was on. Or, to alter the metaphor, a canonization was in progress. Critics from far and wide descended upon Chicago to attend the press view of the exhibition as if it were a religious obligation, and many remained— not so much looking at the show as transfixed by it—far longer than is usually the case with such events. The atmosphere at the press view was in fact exceptionally solemn and respectful, and to the note of reverence that dominated the occasion there was added at times a discernible element of intellectual anxiety as the large, stately galleries of the Art Institute took on the air of an examination hall in which the critics could be observed checking with the curators and with each other to see who might have the right answers. It would have been unthinkable in such a hushed and reverential atmosphere to crack a joke, especially a vulgar one—which, as a matter of fact, is what critics often do at such events—and everyone seemed agreed that the one thing that would not be mentioned, despite the Mary Boone connection, was the artist’s prices. You do not mention money in such sanctified surroundings. I have been going to the press views of museum shows for more than thirty years, and I’ve never seen anything to equal the solemnity of this one. Given this response, it is a mercy, of course, that Kiefer’s work is as good as it is. It may be premature to speak of his “greatness,” and victories of the moral imagination are not, I think, to be so quickly proclaimed, but Kiefer is undoubtedly an artist of extraordinary gifts. The critical questions to be answered are: What exactly are those gifts, and what has the artist accomplished with them? That he is undaunted by the challenge of very large subjects—whole areas of German history, mythology, and culture, and the peculiar modalities of German social pathology, all of which remain, as far as their art is concerned, a closed book to the majority of contemporary artists— does not necessarily mean that Kiefer has been consistently successful in finding a way to deal with such subjects as a painter. The secret of Kiefer’s immense appeal just now—if, indeed, it can be described as a secret—lies, I believe, precisely in his willingness, or, if you will, his compulsion to place these subjects at the center of his art. To the degree that we sense in this compulsion something authentic and involuntary— an impulse that goes beyond anything we have lately come to associate with the tasks of art—it speaks to our own appetite for an art that transcends the aesthetic, and it is natural that we should be exhilarated by our initial encounters with it. As I share in that appetite, at least some of the time, I have a certain sympathy for artists who are driven to minister to its needs, and Kiefer is clearly one of them. (He may even, in this sense, be “the best” in his generation—but where, alas, is the competition?) Yet as I am also aware of how easily such an appetite for the extra-aesthetic is nowadays satisfied—and how short-lived such satisfactions so often turn out to be—I tend to be wary of the kind of art that makes its appeal in the name of something other than art. But is this, in fact, what is actually going on in Kiefer’s art? Or is his status as a visionary with something important to tell us about history and the human condition a phenomenon that has been imposed upon a body of work that cannot finally support the heroic role that is now being assigned to it? I count myself among Kiefer’s admirers, but what I admire in his art does not seem to have much to do with what so many others see in it, or claim to see. For in my view Kiefer is an artist who demonstrates over and over again what, in the last years of the twentieth century, the limits of art—particularly the limits of the art of painting—now are when it comes to dealing with the great moral and historical issues of the modern era. That Kiefer has made a determined and sometimes inspired effort to test and transcend these limits is, it seems to me, undeniable. That he brings immense reserves of energy, imagination, and invention to bear on his quest for a meaning “beyond” art is certainly to be accounted a significant part of his artistic enterprise. But the quest itself has an essentially Sisyphean character; it is its destiny to be repeatedly defeated. It is this pattern of Sisyphean defeat that gives to Kiefer’s art its special poignancy—a poignancy, it must be said, that is not always clearly distinguishable from a certain mode of German sentimentality. The spiritual yearning in Kiefer’s work is something that we are all made to feel. There is no way to miss it, if only because it is given such elaborate, operatic trappings. But in neither art nor life are yearnings to be mistaken for realizations. And in art at least, it is only realization that counts. Everything else—even the most exalted yearnings—belongs to the realm of failed dreams. Kiefer paints—or perhaps one should say constructs, for he uses all sorts of materials —three types of pictures: landscapes, images of architecture, and what might be called didactic diagrams or charts. Many are of immense size, most conform to a bleak and mournful palette of blacks, grays, and earth colors, some—quite a few—have words inelegantly painted onto their surfaces, and all are weighted with symbols drawn from history, mythology, literature, folklore, or the artist’s own biography. The best of these paintings are the more recent symbolic landscapes: Nuremberg (1982), The Mastersingers (1981-82), Midgard (1980-85), The Book (1979-85), The Order of the Angels (1983-84), Emanation (1984-86), and Jerusalem (1986). The least successful are certain of the didactic-chart paintings—Way of Worldly Wisdom (1976-77), for example, which is said to commemorate, with appropriate irony, the victory of the ancient Germans over Roman invaders at the Battle of the Teutoburg Forest in the Year A.D. 9. I must confess to having no interest in the subject, and the ponderous ineptitude with which the painting is executed, even if intended as a mockery of the theme (but how can one tell? ), does not offer much in the way of aesthetic compensation. Kiefer’s gift is the characteristic German gift for graphic images, but wherever his subject calls for the representation of faces or figures—Ways of Worldly Wisdom is almost all faces—he shows himself to be a very inadequate draftsman. His drawing is always at its best—which is to say, most powerful and moving—where it serves, as it does in the symbolic landscapes, to provide his paintings with a simplified, overscale format. It is drawing that takes little interest in the subtleties of pictorial space —as we can see at a glance in the macabre architectural paintings. If not for their references to the architecture that Albert Speer created for the Nazi regime or their other historical allusions, the architectural paintings would have to be considered eccentric variations on familiar academic themes. Even with their highly charged “content,” I am not sure they escape a descent into pictorial cliche. It is, in any case, on the basis of the symbolic landscapes—and on certain works on paper that are related to them—that Kiefer is likely to survive and develop as a significant artist. The architectural paintings are a dead end, and the didactic charts and diagrams have already been abandoned. It is in the contemplation of nature that Kiefer’s pictorial imagination seems to attain an expressive freedom it does not enjoy in relation to his other subjects. For the German imagination, nature is not always a realm entirely distinguishable from culture. In Kiefer’s painting, certainly, nature is by no means free of the darkness of history that is his abiding obsession. It is deeply implicated in the myths of a culture that has conferred so many spiritual or symbolic meanings on natural phenomena that the life of the earth seems at times to have been stripped of its independent existence. Which is to say that for Kiefer, as for so many German artists, nature is an allegory—a world of spirit as well as a realm of organic materiality—and it is in the effort to encompass its double nature, so to speak, that his landscape paintings achieve their special distinction. There is much about these landscape paintings that identifies them as belonging to the Neo-Expressionist school—not only their oversize, “heroic” scale, but their curious mix of materials: straw, lead, sand, crockery, etc. In Kiefer’s case, however, we are always made to feel that something akin to a systematic iconography is what governs this use of materials even if we cannot instantly identify the exact iconographic use to which they are being put. More often than not, there is in these landscapes an overload of materials attached to their surfaces that makes the paintings look heavy, ponderous, and overworked in the Neo-Expressionist manner. Yet in Kiefer’s case, these excesses appear, paradoxically, to be in the firm control of a very particular vision—a vision that is mystical in the German style, turning every material perception into a metaphysical conundrum. About this whole aspect of Kiefer’s work, the wonderfully detailed catalogue that Mark Rosenthal has written to accompany the exhibition is an indispensable guide. James N. Wood and Anne d’Harnoncourt, in their Foreword to the catalogue, speak of Mr. Rosenthal’s lengthy text as “an essential tool for our understanding of the quotations and iconography that are central to [Kiefer’s] work, much as a skillfully annotated edition of Ulysses aids the reader of Joyce,” and they are right to do so. 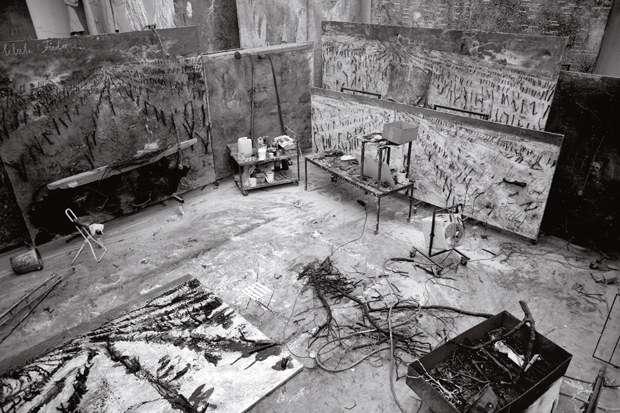 On everything from the kind of use Kiefer has made of Caspar David Friedrich and Jackson Pollock to his relation to Joseph Beuys to more specifically iconographic research— which buildings are referred to, what historical events or literary symbols or private experiences are invoked—Mr. Rosenthal can usually be relied upon to give us the requisite information. In this respect, his catalogue is a triumph of art-historical scholarship. But, as is even the case with Ulysses, such aids to understanding esoteric allusions are not to be taken as a substitute for our experience of the work itself. Even when we find ourselves properly informed about the Battle of the Teutoburg Forest, there is still the problem of what to make of Ways of Worldly Wisdom as a painting. The landscape paintings are less problematic, to be sure, because they are so much more accomplished—so immediately compelling—as paintings. They have a power, at once pictorial and poetic, that is not dependent on our perfect understanding of their symbolism. Kiefer is an artist who imparts to every picture a characteristic emotion—an emotion that is relentlessly dour and obsessed with death—and you can’t mistake it for anything else. Every painting sounds the requiem note, and the landscape paintings sound that note more effectively than any others. Indeed, I think it is only in the landscape paintings that Kiefer has to some extent freed his painting from its dependence on hermetic symbolism and achieved the kind of archetypal expression he is searching for. The landscape paintings are wasteland paintings. They are scorched-earth images—images of an earth and a world that is rotting and returning to the primordial mud. They are images of a sublime that has “fallen” into decay. Their real subject is death, and the death that haunts them is as much the death of art as it is the death of the earth. All of this can be vividly—and indeed, insistently—seen in the so-called “books” that Kiefer has produced in such profusion, for what are these large sketchbooks or scrapbooks of images and non-images if not an avowal of the death of art in the face of the enormities of modern history? In speaking of Kiefer’s relation to Joseph Beuys, Mr. Rosenthal writes that Kiefer “undoubtedly gained from [Beuys] an enormous sense of mission and ambition, that is, the wish to grasp great regions of human history within the boundaries of his art.” It is this sense of a great mission that has conferred on Kiefer’s enterprise its enormous prestige. Yet in the celebration that is now being lavished on this gifted and unusual artist, we ought not to overlook the central place that the death motif occupies in the oeuvre that is celebrated. For myself, though my admiration for Kiefer is undiminished, I cannot say that I have been persuaded that he has succeeded in bringing “great regions of human history within the boundaries of his art.” On the contrary, what this retrospective makes clear to this observer, at least, is that the object of Kiefer’s Sisyphean quest continues to elude him. The Kiefer exhibition, jointly organized by the Art Institute of Chicago and the Philadelphia Museum of Art, was shown in Chicago from December 5 to January 31. It will be on view in Philadelphia from March 6 to May 1, and will then travel to the Museum of Contemporary Art in Los Angeles (June 14-September 11) and the Museum of Modern Art in New York (October 17-January 3, 1989). Go back to the text. Anselm Kiefer, by Mark Rosenthal. The museum (paperback) edition is published by Chicago and Philadelphia at $24.95. The trade (hardcover) edition is distributed by the Neues Publishing Company at $35.00. Go back to the text. On Kiefer’s relation to Beuys, see also Sanford Schwartz’s article, “Anselm Kiefer, Joseph Beuys, and the Ghosts of the Fatherland,” in The New Criterion for March 1983. Go back to the text. August 19, 2011, 1:30 p.m. In 1969, he photographed himself giving Nazi salutes in public. Forty years on, Anselm Kiefer is a titan of world art, but his controversial work still picks at the scabs of the Fatherland’s history. So why does this most German of artists live and work in Paris’s Jewish quarter? Like just about every school in the Marais district of Paris, the école élémentaire around the corner from rue Michel-le-Comte bears a plaque to the memory of its most famous pupils – not scholars or statesmen, but those who were among the “11,000 enfants furent déportés de France par les Nazis et assassinés dans les camps de la mort parce que nés juifs”: the 11,000 children deported from France by the Nazis and killed in death camps because they were born Jews. Things that happened nearly seven decades ago are alive on the streets of this still-Jewish quarter of Paris, and nowhere more so than in the vast hôtel particulier that is the home and studio of Anselm Kiefer. You’ll know Kiefer: it’s hard not to. If you went to the Royal Academy a couple of springs ago, you’ll have cricked your necks looking up at Jericho, the twin towers the honorary Royal Academician had built in the courtyard of Burlington House – 50 foot menhirs of concrete heaped in teetering piles like cargo containers in stone. These paled beside’ the 52 structures Kiefer has erected in the years since 1993 at his other studio, La Ribaute, near Nîmes in the South of France – a one-time silk factory whose 85-acre estate includes tunnels, hills and caves, all woven into a massive Gesamtkunstwerk or total work of art. If your travels haven’t taken you to the Cévennes of late, you might have seen Aperiatur Terra, the artist’s 2007 show of largely monumental canvases – typically 10ft high and 25ft long – at the St James’s branch of his London gallery, White Cube. And if all of these have passed you by, then you can discover Kiefer later this month in exhibitions at both White Cubes, one show called Fertile Crescent, the other Karfunkelfee [roughly, Carbuncle Fairy]. 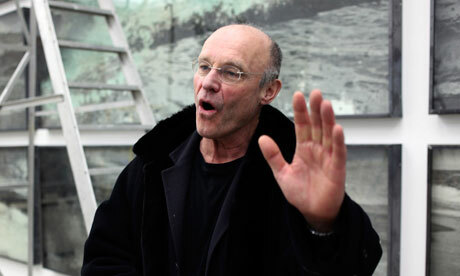 All of which is to say that Anselm Kiefer and his art are a very big deal indeed, and in various senses of the term. None of this answers the obvious question, though: why a German artist, born in the dying days of Hitler’s Götterdämmerung, has chosen to live and work in the Marais. To answer that, you need to rewind to last July and shift arrondissements from the 3rd to the adjoining 11th – to the Opéra Bastille and the piece which Kiefer staged there, called Am Anfang (In the Beginning). As with much of his work, Am Anfang is difficult to categorise. The piece being shown in an opera house, the audience may have expected something in the line of bel canto. They didn’t get it. The curtain rose on a scene of desolation, towers like those in Jericho multiplied into a ghost town. Through these wandered a group of women, clinking bricks with hammers to the mildly atonal music of Kiefer’s compatriot, Jörg Widmann. The scene looked vaguely biblical, and, on one level, it was: one of the women was Shekhinah, the Talmudic version of the Holy Spirit, while another was Lilith, Adam’s apocryphally demonic first wife. None of this seemed to impress the audience, though, a number of whom booed roundly from curtain up. What, precisely, was their problem? In the absence of any home-grown artist of world standing, the French government has courted Kiefer with the kind of privileges last accorded to Picasso. It was Kiefer whose work was chosen for the re-opening show of the Grand Palais in 2007, who was last year invited to decorate a staircase at the Louvre – an honour given to only one other artist since the war – and who was asked to write Am Anfang to mark the 20th anniversary of the Opéra Bastille. A little resentment on the part of the French arts establishment would be understandable. Then again, Parisian opera-goers may simply have found Am Anfang obscure and pretentious, which it was. The work’s title is taken from the opening words of the German bible (Am Anfang schuf Gott Himmel und Erde: In the beginning, God created Heaven and Earth), its libretto made up of quotations from the Old Testament. The 180-page programme to the work listed its librettist as “Anselm Kiefer, after the prophets Isaiah and Jeremiah”. We are not talking Bizet here. Possibly, though, the audience was bothered by the fact that Am Anfang seemed to suggest that Biblical ruination and the destruction rained down on Germany at the end of the war were part of the same process; that the sufferings of Old Testament Jews and Nazi-era Germans were equivalent. Lilith and the rest may have been Israelis, but in Am Anfang they looked like Trümmerfrauen – the “rubble women” who picked bricks from the ruins of cities such as Hamburg and ‘ Dresden in the years after the war. Sitting in the vast library of his vast Paris house, Kiefer recalls those years. Born into a Catholic family in the pretty Black Forest town of Donaueschingen in March 1945, seven weeks before Hitler’s suicide and the end of the war, the artist is a youthful 64. Children by his Austrian second wife, Renate Graf, run about, apparently disappointed that the Englishman called Charles who has come to interview their father is not the Prince of Wales. Kiefer, wiry and in Lord Longford glasses, looks vaguely priestly: he giggles when I say so. It seems an odd fondness for a man who chooses to live in a perfect 17th-century mansion in the un-bombed heart of France’s un-scarred capital, a point with which Kiefer disarmingly agrees. “Towns that are really well done, like Paris, they are finished,” he says, nodding rapidly. “There is nothing you can add. They need bombs, these towns, to be interesting, no? With ruins, you start again. Then they could become enigmatic.” Distantly, I seem to hear the booing at Am Anfang; it is broken by the phone ringing, a call from the White Cube’s owner, Jay Jopling. “Jay!” Kiefer cries. “The Independent is here! He wants to interview you! He wants to ask you if I am a Nazi!” I cringe slightly, as, I have no doubt, does Jopling. Having begun by blotting his copybook in heroic form, Kiefer went on to provoke his countrymen mightily. Throughout the 1970s, he made art that alluded to Teutonic myths, to Wagner, to the dark, soughing forests of Caspar David Friedrich. (By happy coincidence, Kiefer means “pine tree” in German.) Some of this art was shown at the 1980 Venice Biennale, to predictable critical outrage back home. The problem was that works such as Malerei der verbrannten Erde (Painting of the Burned Earth), made with the help of Wagnerian fire and axe, were not clearly anti-German. In a day when history was being rewritten backwards to impeach Wotan, Bayreuth and the Black Forest as pre-conspirators in Nazism, Kiefer’s work refused to toe the party line. Making himself a kind of Teutonic Everyman, the artist simply would not airbrush his own German-ness out of the picture. For many, this failure to bury the past made him complicit in it. Which, I think, explains the house in the Marais, part of Kiefer’s dogged refusal to make life comfortable for himself or other people. I earlier described Am Anfang as obscure and pretentious, and I did not mean those things nastily. To understand the work of most contemporary British artists, you could probably get by on a bit of Baudrillard, a copy of The Naked Lunch and The Ladybird Book of Science. To get Kiefer, it very much helps if you speak Sanskrit, can recite the Latin Mass and have a working knowledge of the works of Paul Celan and Velimir Khlebnikov. These last have been a particular source of inspiration to the artist over the past decade. Since Kiefer left Germany, his work has become less specifically German and more syncretic, historically omnivorous: contentiously, Jewish Kabbalism is a favourite current source. Celan, a Romanian Jew whose parents were murdered in the Holocaust, went on writing in German after the war – “In the language of the killers, the criminals,” says Kiefer. “It’s as [the 1960s Austrian poet] Ingeborg Bachmann said: your native tongue is like a house, that you have to go on living in it even if you don’t like it.” Khlebnikov, the dedicatee of Kiefer’s 2005 show at White Cube, was a noisy Russian Futurist who invented a universal language known as Zaum. The two poets dealt with the problem of cultural inheritance in different ways, the one by embracing it with nose tightly held, the other by radically reinventing it. Kiefer’s art has a go at both. All of which means that the work you’ll see at White Cube this autumn is pretty much what you’d expect to find if you’ve followed Kiefer’s history. His is not an art of novelties: it is an art of glacially slow accretions, and an archaeological excavation of these. New paintings such as Liliths Töchter hark back to the dark Teutonic woods of work made in 1971, to the steep recessions of the fields in which Kiefer stood, a young artist, saluting Hitler, 40 years ago. The history of these latest works is buried in their own three-inch-thick pigment as if in a shallow grave. Or, perhaps, in ruins. Anselm Kiefer has scaled back, way back, from his preposterously overproduced previous solo at Gagosian, but with Kiefer we are always talking about relative degrees of gigantism. The Gagosian space is crowded with 25 sculptures encased in large, often towering vitrines with floors of cracked (or scorched) earth. Each contains a sinister ruin: the fuselage or engine of a vintage airplane; a fleet of small suspended U-boats made of lead; a white plaster ball or wedding gown jagged with shards of glass; an immense and brittle thorn bush dotted with painted flames. The scuttlebutt I heard at the time was that it cost a million dollars simply to install the exhibition — a figure that does not seem out of line given the quantity of plate glass that had to be factored into the handling. In many ways, the new show is a retrenchment. Fifteen out of the eighteen works on display are paintings. There are no vitrines, just a few freestanding sculptures. Some of the paintings contain elements that project into the room, but most do not. While the vitrines in Jerusalem felt simultaneously precious and over-the-top, they were also something different, an exploration of new territory even if the themes were recycled. In contrast, the most successful paintings in Morgenthau Plan, as the new show is called, could have been made at any point in the artist’s career. I am thinking of two in particular, “Nigredo – Morgenthau” and “der Morgenthau-Plan” (both 2012), which present Kiefer’s familiar blasted landscapes with a powerful density of materials and a refined sense of touch. However, the rest of the works, with a few exceptions, range from the middling to the embarrassing. What is remarkable is that Kiefer himself supplies the reason why. The exhibition’s title refers to a proposal drawn up in 1944 by Franklin Delano Roosevelt’s Secretary of the Treasury, Henry Morgenthau, that would take the demilitarization imposed upon Germany after World War I many steps further, leading to a total deindustrialization of the country. Factories would be decommissioned and the economy would revert to a form of pre-modern agrarianism. Unless a person wishes to practice l’art pour l’art, he needs a subject. But where does that subject come from? This past year I have painted a number of pictures of flowers. […] They’re beautiful. But beauty in art needs meaning. One can’t have just beauty on its own. True art does not portray beauty alone. Beauty needs a counterpart. And these paintings are unusually colorful and beautiful, again, in relative terms, for Kiefer. Some of the color shifts, from icy blue or hot pink to the ashen gray we know so well, are stunning. But they are also unstructured and pictorial in the most illustrative sense. Their masterful wielding of surface and pigment knocked me out at first glance, but I eventually started to cringe. If he paints flowers for six months and they become more and more beautiful, closer to perfection, he begins to believe he is losing himself, his identity as a painter, as a good painter. He can even develop a bad conscience because the subject is so easy. […] In thinking about this flaw another flaw occurred to me: the Morgenthau Plan. For it too ignored the complexity of things. With the destruction of industrial sites more land would have been gained. The fields would have been opened up for plants of all kinds, for carpets of flowers everywhere. And so the paintings map out an alternate history for Germany in which the Morgenthau Plan has been put in place and the country’s industrial zones have reverted to their natural state. The only problem is that the concept has been retroactively ”associated with the flower paintings.” They did not spring from the idea, which bristles with paradoxes (Morgenthau’s radical proposition, presumably based on the belief that the Germans are an incorrigibly warlike race, played into the hands of Joseph Goebbels, Hitler’s propaganda minister, and he used it to rally the population, an effort that possibly extended the length of the war). Consequently, the repurposed paintings lack all urgency, devoid of historical focus as well as the formal rigor and abstract thinking that make something as florally sumptuous as Monet’s water lilies, to choose an obvious comparison, continually compelling to contemporary eyes. Portentously titled “Next Year in Jerusalem,” the Gagosian exhibition is effective middlebrow art as catharsis, spectacle with a message. That’s pretty damning, and while such an assessment doesn’t necessarily carry over to the work in this show as a whole, it’s hard to shake the “middlebrow” epithet while looking at a painting like “Große Eisenfaust Deutschland, kleine Panzerfaust Deutschland (Velimir Chlebnikow)” (2012), a field of flowers with rusting machine guns mounted at the top. Kiefer’s interplay between two and three dimensions is a well-worn trope by now, but it may not seem so stale if his pairing of disused weaponry with an overgrown landscape weren’t so obvious and literal. The same holds true for the even more theatrical “O Halme, ihr Halme, o Halme der Nacht” (2012), in which the guns are replaced by an airplane wing. There are two works, however, that stand apart from the others. One is “Von der Maas bis an die Memel, von der Etsch bis an den Belt” (2011-2012), a colossal Romantic seascape with Courbet-style waves rolling ahsore and heavy, lowering clouds along the horizon line. The work’s distinctive painterly realism and blue-dominant coloration pull you in, but after a few moments the 19th-century look begins to feel uncomfortably retro, as if Kiefer is attempting to revive a long-dead style for no particular reason. What I found more intriguing was “Oh Halme, ihr Halme, o Halme der Nacht” (2012), which features a typically blackish Kiefer landscape — a furrowed field diminishing in raked single point perspective — with handwritten text taking up the entire upper half of the picture, from the horizon line to the top of the canvas. Kiefer’s practice has always incorporated words or phrases that reflect the work’s titles or themes. Sometimes this is quite evocative, as in his series “Dein Goldenes Haar, Margarete,” but just as often the meaning of the painting can depend too much on what is written on the surface. In “Oh Halme,” Kiefer appears to have allowed his literary bent to run wild. If the actual meaning of the text remains obscure to non-German speakers, its intrusion upon the landscape nevertheless creates a disruptive and refreshing visual element. Compared to “Nigredo – Morgenthau” and “der Morgenthau-Plan,” the two paintings I mentioned earlier — which, though impressive works, do not escape the trap Smith defines in the same review as Kiefer becoming “better and better at making Anselm Kiefers” — it feels less assured, even confused and hesitant. But for a superstar painter, that seems like a good place to be. Anselm Kiefer: Morgenthau Plan continues at Gagosian Gallery (522 West 21st Street, Chelsea, Manhattan) through June 8. In 1969 Anselm Kiefer, then a 24-year-old art student in Karlsruhe, travelled round various locations in France, Switzerland and Italy where he was photographed giving the “sieg heil” (Hitlergruß) salute outside prominent buildings. His exhibiting of a selection of the images, under the title Occupations (Bezetzung), for his degree show provoked anxious incomprehension among his tutors and, later, anger among the public and critics. The taboo-breaking work has now entered the art-historical canon and Kiefer has been credited with an early “naming” of the evil that so many of his countrymen had chosen to forget, but more than 40 years after it was produced, Occupations remains one of the most polarising artworks to have emerged from postwar Germany. Kiefer’s willingness to engage with the German myths and preoccupations that had been contaminated by association with Nazism earned him a certain notoriety throughout the 1970s and 80s. He worked in the darkly symbolic forests, echoed Caspar David Friedrich’s romantic landscapes and cited Wagner via photography, painting and sculpture. He incorporated the alchemical materials of fire and melted metals and became increasingly absorbed by the Jewish myths and beliefs that the Nazis had attempted to eradicate. Over time he began to co-opt his long-standing interest in poetry and myths from many different cultures, not so much in search of a solution to the questions of why we are here and what we are doing, but more to explore human philosophical endeavour in the face of the uncaring natural processes of entropy and decay. Kiefer was in London last week to install his new show at the White Cube gallery. Despite the almost theatrically high seriousness of his work, the now 66-year-old artist cuts a rather cheery figure as he greets staff and checks lighting levels at the gallery, accompanied by his wife and two young children. The exhibition is named after a play by the 19th-century Austrian writer Franz Grillparzer, Des Meeres und der Liebe Wellen (The Waves of Sea and Love), about the Greek priestess Hero and her lover, Leander, who drowned while swimming the Hellespont to be with her. The show comprises large photographs of seascapes, some of which have been subject to various processes, including electrolysis, to ensure that their surface, when exposed to the air, changes appearance over time. Variously superimposed upon the images are obstetric implements, Euclidian drawings, a lead model of a U-boat and the presence of Kiefer himself. He was making “quite big pictures for a very small child” from as far back as he can remember, but although his facility for art was always acknowledged, Kiefer chose to study law at university, claiming that he must have “had some sort of complex in that I thought I was already an artistic genius and so didn’t need art school. And while I never wanted to be a lawyer, I was interested in the language of law. A law textbook is amazing in how little it has to do with life. In that sense I suppose it is a little like art.” While at law school he continued to make art, but eventually realised he needed to meet with other artists, and so transferred to art school. “Before then I hadn’t really kept any of my work; this felt like a real start.” It coincided with him also first properly comprehending recent German history. Kiefer’s relationship with the processes of time goes beyond mere acceptance. He leaves sculptures and paintings outdoors exposed to the elements. He has subjected his work to acid, flamethrowers and axe attacks. At the White Cube show the colours are already changing. The huge photographs will remain stable while they are sealed under glass, but as soon as they are exposed to the air they will become dynamic. This sense of the provisional and contingent, and the resistance to the idea of a “finished” work, raises philosophical questions as to the curation of his, and by extension of all, art. Talks are underway to establish a joint German-French foundation to look after the Barjac complex, with the specific intention of allowing nature to slowly reclaim the site. Curating his art has become less a matter of conserving it than accompanying it through history.